Even as the economy recovers from the 2008-2009 recession, securities firms and other financial institutions continue the process of adapting to the legislation which resulted. Businesses and their attorneys continue to feel the impact of the Dodd-Frank Act and similar laws. 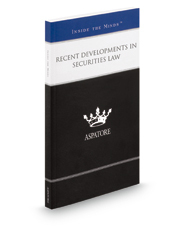 In light of those developments, it's more important than ever for securities lawyers to help their clients construct sound compliance plans, understand the laws governing both purchase and sale of securities, and navigate the evolving technology that continues to change both the securities market and the laws governing it. Recent Developments in Securities Law provides in-depth discussions of these issues, as well as others, such as the Jumpstart Our Business Startups (JOBS) Act, recent changes to rules about public offerings, and the way state regulations interact with federal law. Additionally, these authors examine the economic and political environment that led to the recent changes, and predict where these trends will likely lead in the future.